CW3E is pleased to welcome Dr. Ryan Spackman! Ryan, an atmospheric chemist, will play a critical role bridging CW3E’s dynamics-focused capabilities with chemistry prowess. As deputy principal investigator for NASA Earth Venture and as a member of the CalWater 2 Core Scientific Steering Group, Ryan brings extensive expertise with airborne science campaign planning, execution and delivery of results. Ryan has a passion for observing the components of the water budget and using this data to evaluate weather and climate models. 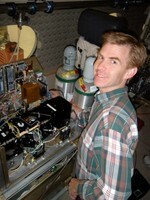 Graduating with a PhD from Harvard in 2004, Ryan continues to work with NOAA’s Earth System Research Laboratory and Science and Technology Corporation. Ryan’s abilities, enthusiasm and energy are superb additions to the CW3E group.